Residents point out the drainage system, which was clogged during the floods. 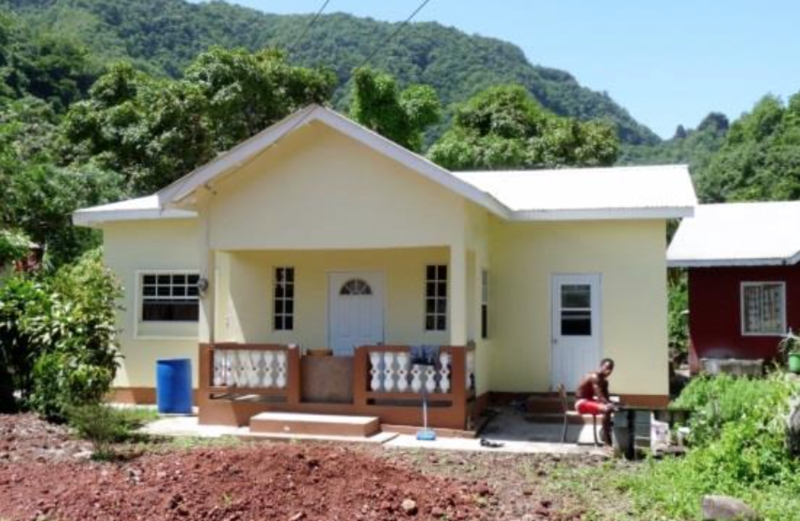 Spring Village is a rural community of less than 5,000 residents in St. Vincent and the Grenadines. It’s an hour-and-a-half drive from the island’s capital of Kingstown up winding, mountain roads. Perched on a steep hill, the village is highly vulnerable to floods after heavy rains. To make matters worse, many residents are living inside or at the edge of a dry riverbed, which is subject to flash floods. Sheila Jeffrey Robertson, 45, recalls how she and her kids narrowly escaped from their home during the 2013 floods. Sheila Robertson explains how the flood waters damaged her home and scattered debris around her property. PADF is working in Spring Village to train a group of youth to prepare for and respond to disasters like this. The group learned first aid, fire safety and how to use GPS devices to map the areas in the community that are most vulnerable. When the rain started to fall heavily, Sheila ran to the store to buy some candles in case they lost power. She remembers water getting into her shoes as she walked home. By the time she reached the house, it was up to her knees. “The drains were filled to the brim,” she says. From her living room, she looked out the window to see the riverbed covered in water. “I’d never seen the stones covered,” she recalls. The village had no early warning system for storms. A neighbor came and told Sheila it was time to evacuate. She grabbed her youngest son and tossed him over the gate, running back inside to get her son and daughter. They got out just before water started coming into the house. The damage was so extensive that she had to rebuild and completely refurnish her home. Sheila is happy that PADF is working to inform youth in the community about the risks of flooding. The group is planning a project to improve drainage systems and implement an early warning mechanism when the water is rising. “It would benefit us a lot,” she says.